Looking for kitchen organization ideas? Find out some of the best tips for a kitchen remodel and organizing principles for a functional kitchen. Thank you to KraftMaid for sponsoring this post; as always, text and opinions are my own. It’s been about a year and a half since we remodeled our kitchen, and I’m thrilled to say that I still love the space. 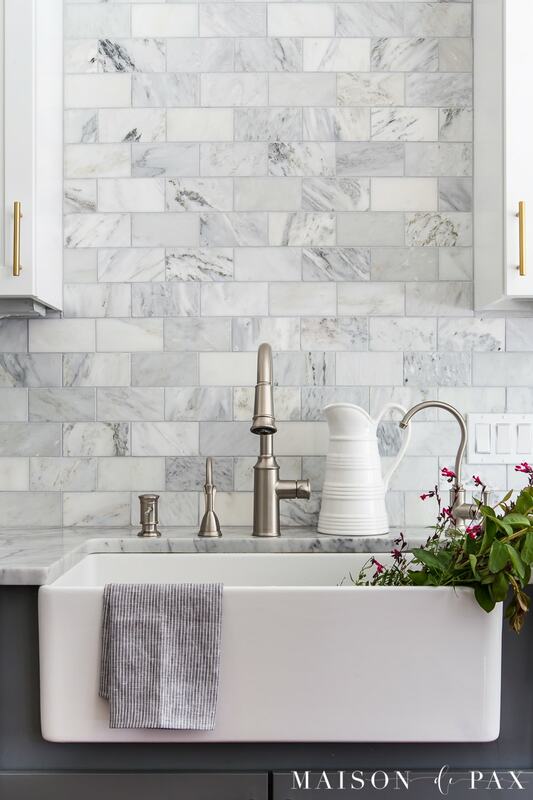 Our marble countertops and backsplash are still gorgeous (and you can see all about how I care for them here). The brass hardware still makes me smile (you can get the details on all the sources in our space here). The single basin farm sink has been perfect for both dishes and baby baths. And the space is so enormously functional as well as beautiful. Perhaps the best decision we made (in retrospect, especially) was to reface our existing cabinetry by painting the frames and purchasing new doors. The kitchen was already outfitted with KraftMaid cabinetry that was in excellent condition, so it was a pretty easy process to simply purchase new doors (in the color and style I preferred) and paint the frames to match. Let me be clear, while KraftMaid is sponsoring this post, the kitchen remodel was not sponsored by KraftMaid. We purchased the new doors ourselves when Home Depot was having a big sale, and I’m so glad we did! The factory finish on the doors is so much more durable than anyone can achieve when repainting existing doors on site. In a year and a half with four kiddos, we haven’t chipped or scratched any of the doors. My positive experience with our kitchen cabinets made it a no brainer when KraftMaid approached me about partnering on this post. 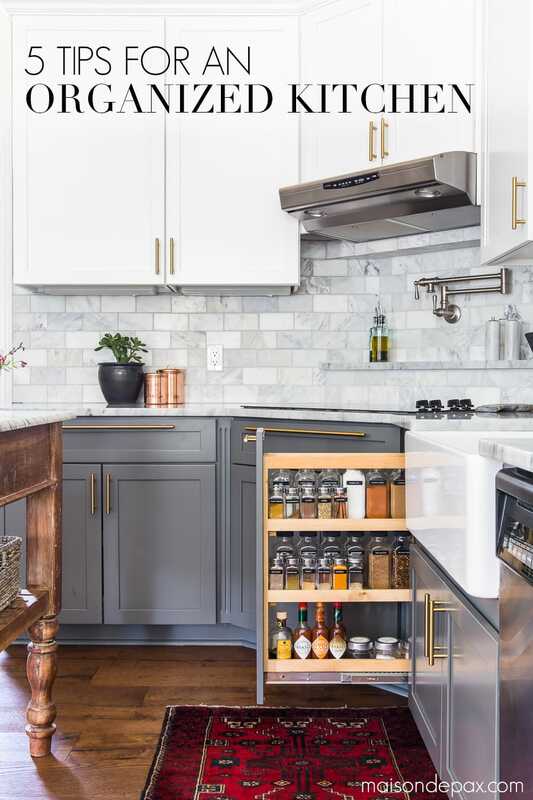 And we love the look of the cabinets, too! White Dove on the top and Greyloft on the bottom proved to be a gorgeous, soothing combo. The two-toned cabinets have done just what I hoped, making the space feel bright but with a slightly more modern edge than an all white kitchen. But what if you’re not ready for a full kitchen remodel right now? 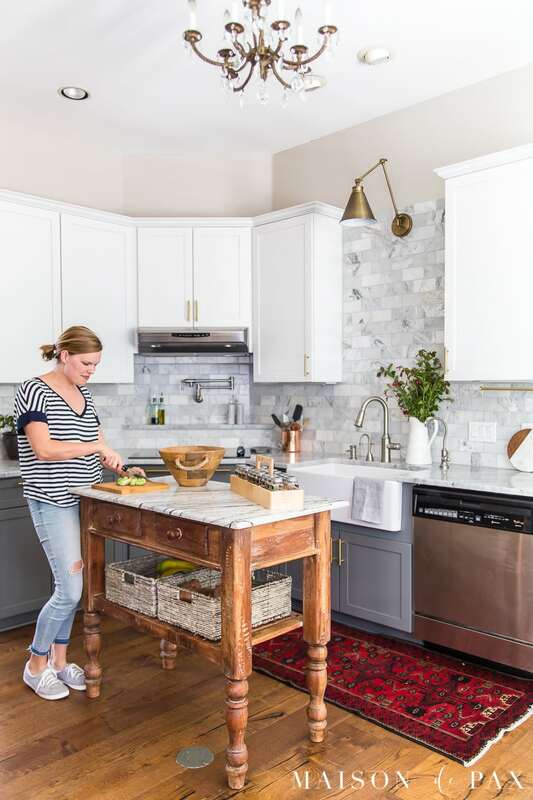 After living with this space for over a year, I’ve got some excellent tips for creating a functional kitchen right now. Stations – Organize your kitchen in stations: baking, cleaning, food prep, coffee… whatever your main activities are, put all the paraphernalia in one place. Coffee is a morning ritual in our home, sometimes two and three times a day. 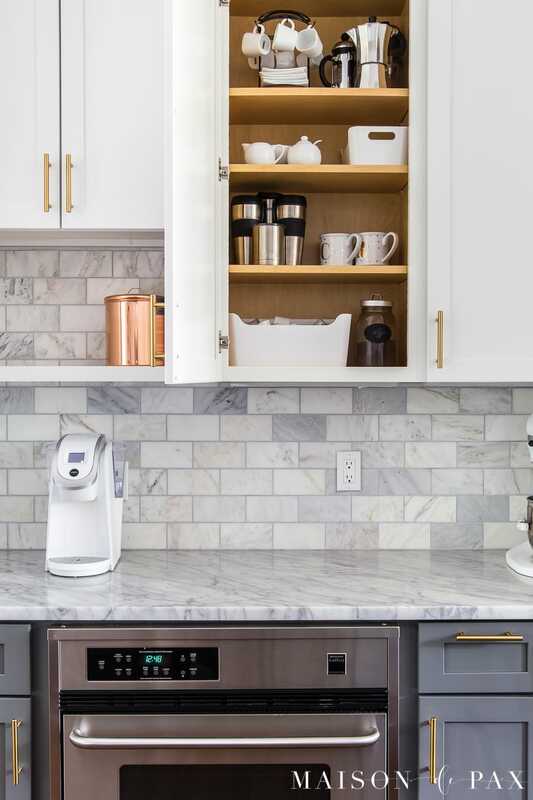 😉 So we have one segment of our cabinetry devote to the supplies, and it’s right by our Keurig, of course. Custom-fit Accessories – Whenever possible, find accessories that fit the exact dimensions of your drawers or cabinets so you don’t waste valuable space. Fortunately for me, the previous kitchen configuration already had one of KraftMaid’s pantry pull outs for spices. 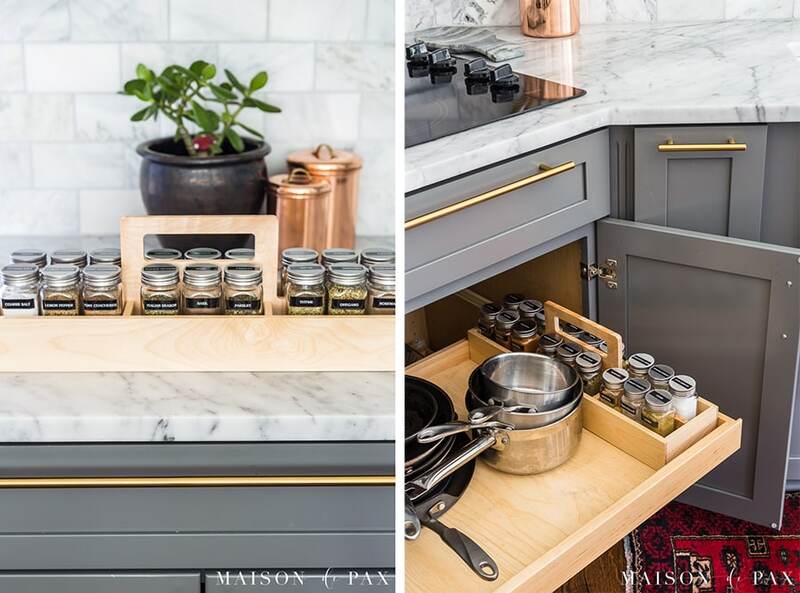 But if you don’t have a spot for one, or if you’re like me and have an overflow of yummy spices ;), then the spice caddy with glass bottles makes a brilliant organizer. 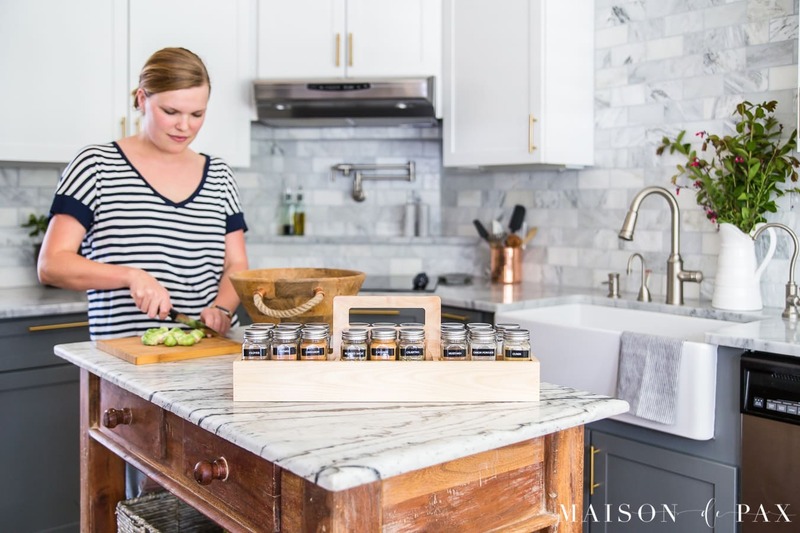 It fits the depth of our KraftMaid cabinets perfectly, and I can lift it out to have all my favorite spices within reach while prepping at the island or – better yet – out by the grill. Kid-friendly Organization – Make the most of your little helpers by putting safe items within their reach. Easy-Access Produce – Store your fruits and vegetables within reach to promote healthy eating. I remember in college once finding a rotten bag of potatoes at the back of our pantry… Never. Again. I still shiver at the memory of that smell. We store most of ours (the ones that don’t need to be refrigerated) in the baskets under the island, and they’re not only pretty but in sight so that we can be sure to eat them while they’re at their best. Built-In Soap Dispenser – Save counter space and mess with a built-in soap pump. I guess this one you might have to wait until your next remodel to implement, but I cannot recommend it more highly. I feel like people have moved away from these little built-in soap dispensers lately in kitchen design and tend more toward pretty bottles of soap and lotion… but I love mine! I think it has helped preserve my marble counters not to have a soap bottle leaving rings and leaves the kitchen sink area less cluttered. And since we use a mild, natural soap, it doubles for both dishes and hands, helping to promote cleanliness (and health!) in a home with four littles. If you have any other questions about our kitchen, please don’t hesitate to ask! You can read all about our experience with marble countertops here. And a full tour and source list is available here. It’s not the biggest space, but I really do find it to be beautiful and functional, and it is serving our family well. What’s your favorite thing in your kitchen that makes it more functional? Be sure to pin it for later! 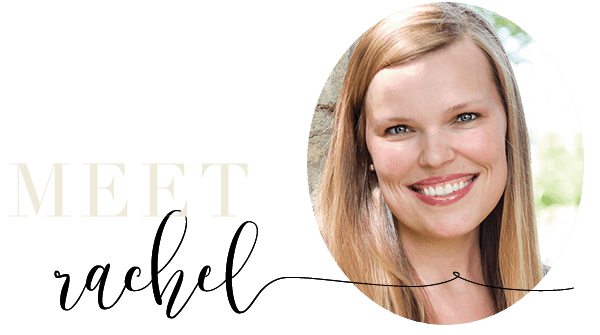 I always love your stunning kitchen, Rachel! Those cabinets are so gorgeous, and thank you for all of the helpful tips!! You are so sweet, Abby! Thank you! I NEED that spice drawer! One day, it’s happening. Great tips, Rachel! Haha… it’s kind of amazing, isn’t it? 😉 Thanks so much, Lauren! Could not agree more with all of these things, Rachel! 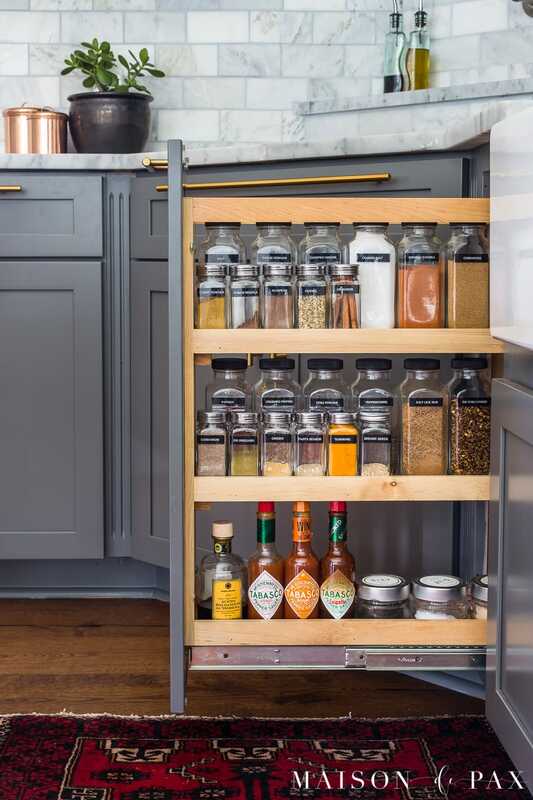 We have some serious work to do in our farmhouse kitchen in both the cabinet and organization department – these are on my list! And your kitchen turned out stunning! Thank you so much, Jenna! And kitchen organization is ALWAYS a good thing, right?! I love your kitchen, Rachel! Such great organization tips. I love how you have the fruit out for kids to grab. I’ve always heard such great things about KraftMaid cabinets. I’m sure you’ll be loving this kitchen for years to come! Yes! I hope so, Jamie. 🙂 . Thank you so much!! Thanks for sharing your insites! Those cabinets are beautiful. Your spice drawer is AMAZING! I need that in my life! Hello Rachel, I love the light you have over your sink and am wondering if you could provide the supplier? We just toss them under the kitchen cabinet. It also makes it easy for the kids to grab. I had KraftMaid cabinets in my previous home. I was talked into using a different brand with my new home build and already very much regret not using KraftMaid again! I have been here only 2 months and have cabinet problems already. That NEVER happened with KraftMaid. I must admit that I did break some hinges (probably my fault from using the doors to pull myself up from a lower cabinet–but I did break that habit by remembering to use the countertop instead) and when I called to inquire about getting those fixed, KraftMaid sent all new hinges–more than I needed so that I would have them if they broke again. My KraftMaid cabinetry is about 12 years old and still all doors and drawers work perfectly! I envy the person who buys my home because their 12 year old KraftMaid cabinets are much better than my 3 month old cabinets! Oh Patty, I’m so sorry to hear you’re having trouble with your new cabinets! But I’m so glad to hear that your experience with your Kraftmaid cabinets has been as good as mine. I hope you are able to get your issues on your new ones fixed. Thanks for the input! Looking to see where you sourced the large and small spice jars? Great question! The Kraftmaid caddy came with the bottles in it, and I am actually planning a full post on the rest of my spice organization soon. In the meantime, here are some affiliate links for you to the exact products I purchased: small jars and large jars. I hope this helps! I love your kitchen and i too have a soap dispenser and i agree. 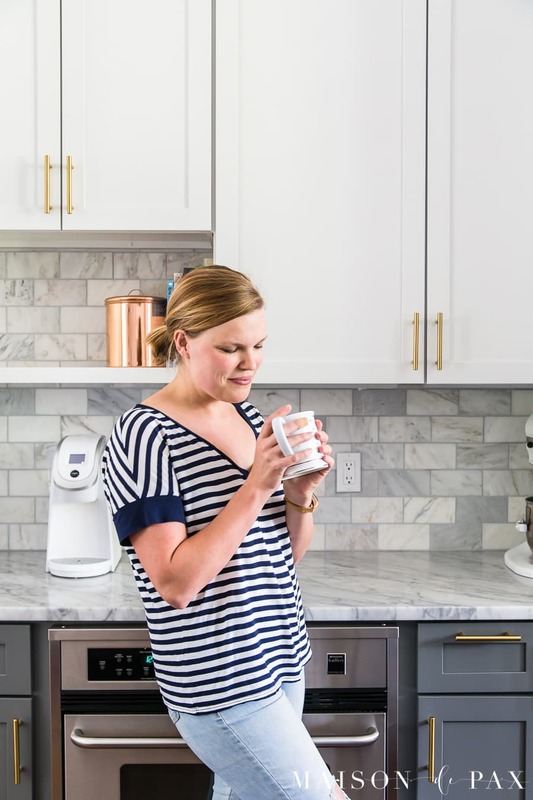 It really does make it easier to have those stations for all the different things we do in the kitchen to save steps although, sometimes it might be a good way for me to get some exercise,ha!ha! Lol. I love it! Get exercise where we can, right? 😉 Thanks, Marlene. Your kitchen is gorgeous Rachel! I would’ve never guessed it wasn’t a recent complete remodel by looking at it. I am currently getting estimates to do a complete kitchen remodel. There are SO many drawer, cabinet, accessory options available today, which is great but also overwhelming to decide. I don’t have a huge kitchen and we are actually taking down a wall (to a peninsula height) between the kitchen and dining/living area. We’re losing our pantry and moving the frig, and moving the microwave/convection oven to the island so it’s going to be a completely different layout. I’m adding cabinets on the dining side of the peninsula so we’ll end up with more space overall. I’m only 4’9” so I am concentrating on making it fuctional, comfortable, and safe for me to reach hot foods, etc. I’m struggling with how to determine the drawer depths and cabinet widths, and spice rack pullouts to accommodate our items and stay functional. I’m thinking of removing all of the dishes, glasses, cookware and food to visualize/ measure what we’ll need. Do you have any other ideas to plan ahead without regrets once it’s time to fill the new cabinets? I will be working with a cabinet maker to design them but I’d like to have my needs in place before meeting with them. Any suggestions would be appreciated! Thank you so much, Sue!! I know how difficult it can be to feel confident in making kitchen redesign choices. I love your decision to make the kitchen more functional for your petite size… what’s the point of a kitchen that functions for someone else when you’re the one living there?! I have found that identifying the things that must stay in my kitchen (the favorite dishes and cookware) and processing roughly how many cabinets they take up now and transcribing that to the new space is important (it sounds like that’s what you’re already planning, which is great!). The other thing I would consider, though, is your various stations and how those will function with the items you’re keeping. Is there a main cabinet near the dishwasher where you want to keep your everyday dishes so that it’s easy to unload them each day? Then make sure that cabinet is big enough to store all those everyday dishes. 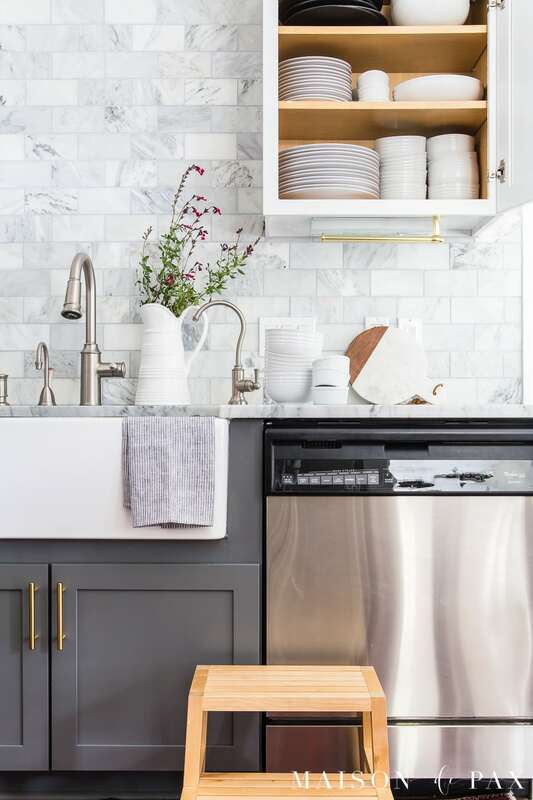 Consider the small appliances or fancier holiday plates you don’t use very often and whether those will all fit in the dining room side cabinetry. Try to visualize not only how much space you’ll need but logical sections of your kitchen. Does that even make sense? I hope it helps in some way!! And congratulations and good luck! Thank you very much for your response. Yes, it is helpful! Of course! So glad I could help. Thank you Sue & Rachel. I am also in the process of remodeling my kitchen. Love all the ideas and information. Will be asking some questions also. Of course! Glad it is helpful! 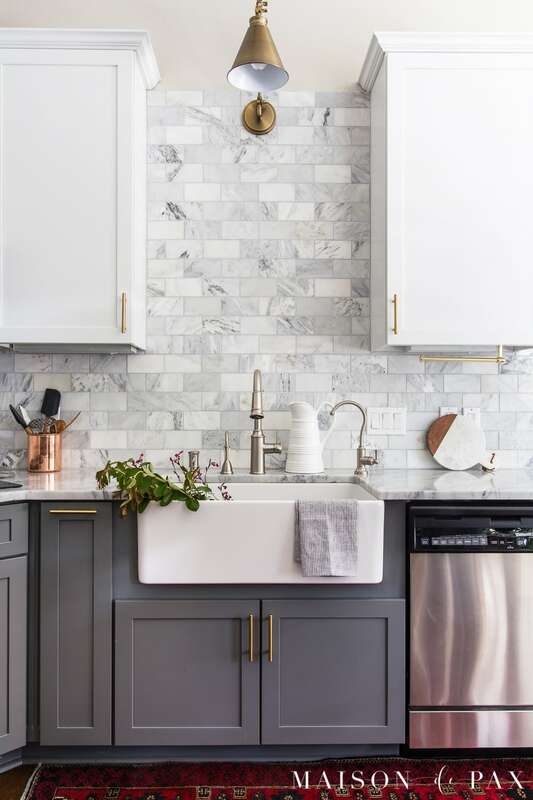 Love your kitchen and particularly the marble – beautiful. 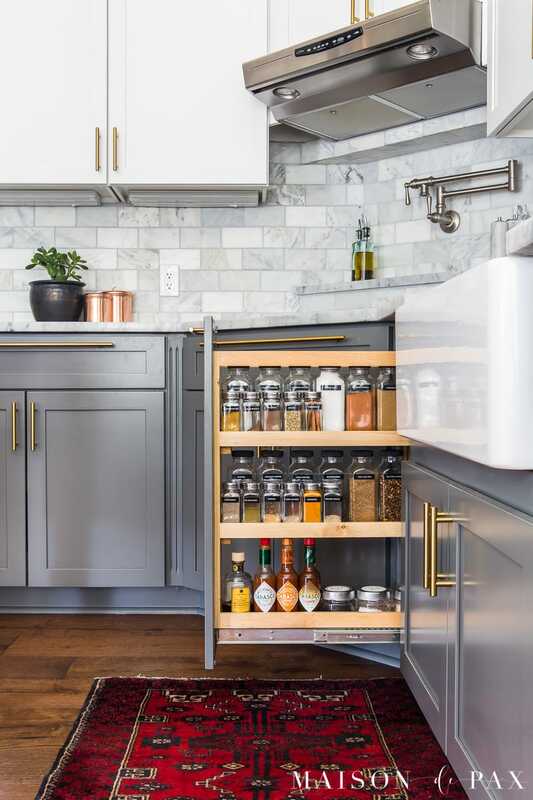 I have a question about the spice pull-out, the large spice bottles – are they plastic or glass and perhaps a source to purchase them! Thanks in advance for your help. I love your kitchen island. I am looking to buy one. Do you have the resource for it? Where can I purchase one like yours or similar? Thanks for sharing your wonderful kitchen! Thank you so much, Melinda! We purchased it several years ago from a shop called Nadeau (furniturewithasoul.com). They don’t sell online, and their inventory changes often, but if you have one locally, I would definitely recommend taking a look! The closest I have seen online are much straighter legs and not marble tops, but (these are affiliate links) this one from Pottery barn has a concrete top and this one from West Elm has a stainless top. The medium brown wood tones with the cooler gray tops remind me a bit of ours. If you are really looking for a marble top, though, this one from William Sonoma is rather pricy, but it’s got a huge marble top and curvy legs. I’m sorry I don’t have a better source for you! Thanks for the link to the large spice bottles…just ordered some to house homemade taco seasoning, onion soup mix, ranch dressing mix, and several more – no more little packets for me! Brilliant! That’s a great use for them. I hope you love them! I love your kitchen. It looks so fresh and clean. I really love that red runner too!! Is is old? Red on the floor of the gray and white just pops. Thanks, Janet! I love that vibrant color of red too! We’ve had it in our home for a while. Your faucet – what is the brand and model no.? Additionally, you mention the soap dispenser (far left) but what are the two faucets that flank both sides on the main faucet and what do you use them for? Yes! My kids love to help in the kitchen too. Wanted to know yours or anyone else that reads this. Looking into getti g farmsink for new kitchen remodel. Wanted to know if it stains? Scratchs? Chips? Has anyone had issuea wirh any of these? How to prevent? Or clean? ( looking at white i think they are porcelain). 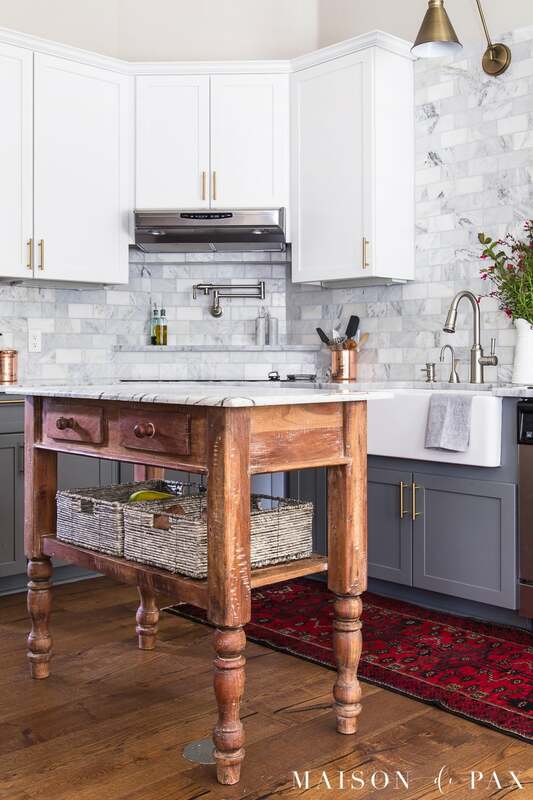 We have a fireclay sink (which is basically the durable ceramic material that they make most farmhouse sinks from, I believe). Before installation, the contractor actually accidentally dropped a hammer from a ladder and it landed on the first sink we ordered and chipped off a big piece (oops!). That was, of course, a ~5 foot drop of a heavy metal object… He replaced that with a new one, and with normal use for two full years, we haven’t had any issues at all. I do think it helps that the one we purchased (which you can find here) has a grate for the bottom of the sink. This protects the bottom from scratches and marks from metal pans. Not all farm sinks come with this, but I do think it’s been a great accessory. I hope this helps! Absolutely stunning design! I’m wondering what company you used for the tile backsplash. I can’t seem to find a close duplicate anywhere. I’d appreciate your help! Rachel Paxton I would definitely go with white or grey checkerboard of your kitchen. I loved the images and inspired of your kitchen organization renovation principles. Keep it up! Thank you, Gail! So glad it inspired you! Yes it inspired me a lot . Keep sharing your ideas!